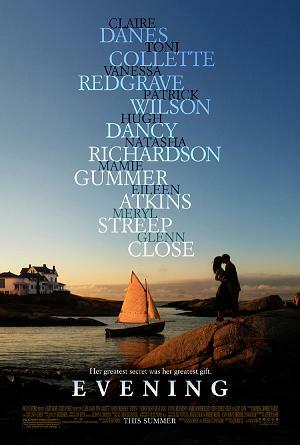 In Evening, directed by Lajos Koltai, Ann Grant (Vanessa Redgrave), while slowly dying on her bed, recalls her youthful days when she fell in love with Harris (Patrick Wilson) and had a strong friendship with Lila (Mamie Gummer). Meryl Streep plays the older version of Lila, Claire Danes plays the younger version of Ann, while Toni Collette and Natascha Richardson play Ann's daughters. Claire Danes has previously starred in Shopgirl, Stage Beauty, The Hours and Romeo and Juliet. She will soon be seen in Stardust, which opens on August 10th, 2007. Mamie Gummer, Meryl Streep's daughter, has been in The Hoax, The House of the Spirits and an uncredited role in Heartburn. I had the privilege to interview both of them together. Focus Features will release Evening on June 29th, 2007. NYC MOVIE GURU: What were your first impressions when you read the script? MG: I loved it. The descriptions and details were so vivid and rich and each character so deeply explored. I fell in love with Lila and felt a kindred [connection to her]. CD: The script was so hard not to be affected by. I knew Michael [Cunningham] from The Hours and had a great affection for him. The idea of working with him again was incredibly appealing. I did a couple of readings of the script over a couple of years, so it had been in my conscious for quite some time and, kind of, germinated. NYC MOVIE GURU: Did you recognize yourself in her? CD: I think that she was so vivid and well-developed that she would have been recognizable to anybody. I admired her—we’re not supposed to judge our characters, [though], but she’s pretty cool. NYC MOVIE GURU: Are you familiar with being a bridesmaid just like your character? CD: I had just gone to my best friend’s wedding about two months before we shot this which was really interesting. She’s now pregnant and I’m the godmother. NYC MOVIE GURU: What’s it like transitioning from theater to film? MG: It feels a little funny, kind of a little alien. I remember one of the first days I was like, “I’m talking too loud.” I was projecting like I had to speak to the mezzanine. It’s a different ball game. NYC MOVIE GURU: What was it like working with Patrick Wilson? CD: His baby was about two months old at the time, so he was completely infatuated and kept showing us pictures. NYC MOVIE GURU: Did you bond between scenes? MG: The house where we were filming, people were still living there so we all sort of camped out in their living room. CD: It was very communal and everyone got along famously and we were very compatible. I remember having an in-depth conversation with [co-writer] Michael Cunningham about what our favorite piece of grammar, punctuation mark was. Semi colon is both of our favorites. We were also wary of the exclamation point. NYC MOVIE GURU: Do you reminisce about your early days of acting on “My So Called Life”? CD: I showed a friend of mine the pilot of “My So Called Life” which I hadn’t seen for about 10 years. Boy was that challenging because it made me very squeamish. It made me want to look at me as a one-year-old because I could make more sense of [that], so I had to look at some home videos. NYC MOVIE GURU: How did you feel while singing in Evening? CD: I was nervous because I didn’t think of myself as a singer. I didn’t have any history with singing, but it was great to discover it. Mamie has an incredible voice. NYC MOVIE GURU: What’s it like having a famous mother? MG: It’s alright. That’s my life. I really don’t know what it’s like not to have a famous mother. CD: My mom feels really famous to me. She’s the most famous person I know. I think all moms feel famous.